Mississippi Class Battleship: Displacement 13,000 Tons, Dimensions, 382'4" (oa) x 77' x 27' (Max)Armament 4 x 12"/45 8 x 8"/45, 8 x 7"/45 12 x 3"/50, 2 21" tt. Armor, 9" Belt, 12" Turrets, 3" Decks, 9" Conning Tower. Machinery, 10,000 HP; 2 vertical, triple expansion engines, 2 screws. Speed, 17 Knots, Crew 744. Operational and Building Data: Laid down by Cramp, Shipbuilding, Philadelphia, PA., May 12, 1904. Launched September 30, 1905. Commissioned February 1, 1908. 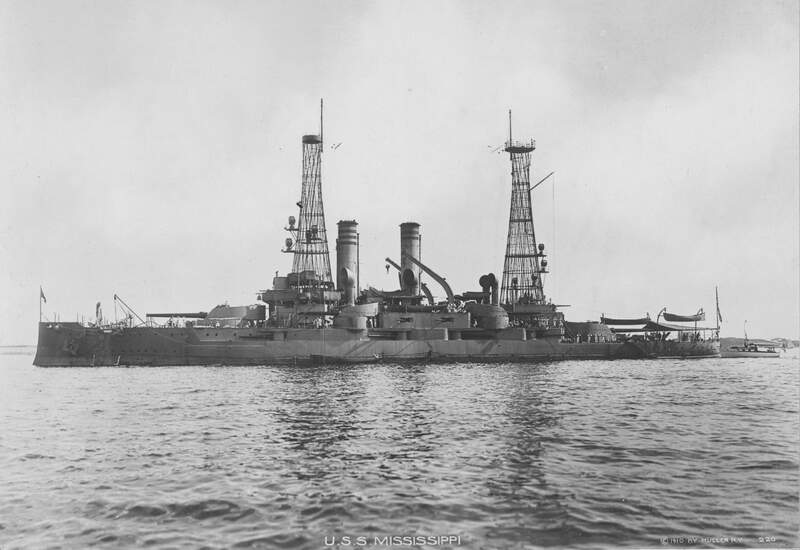 Decommissioned July 21, 1914. Stricken July 21, 1914. 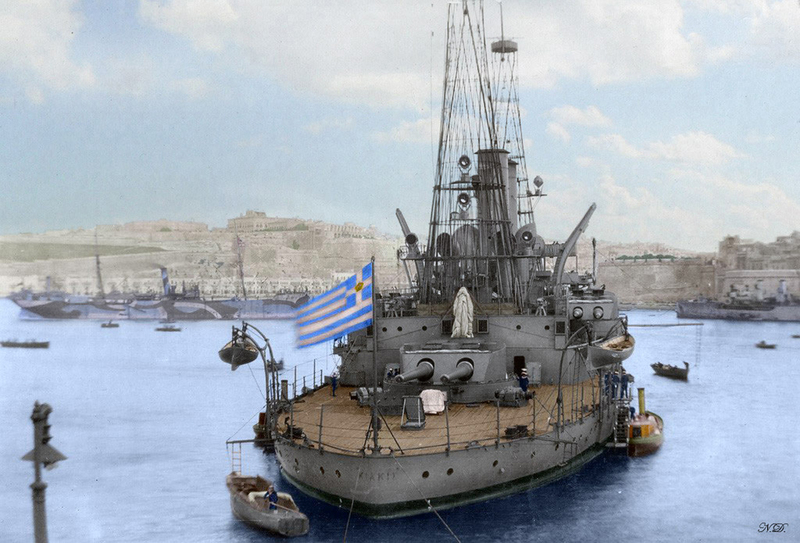 Fate: Sold to Greece, July 21, 1914 & renamed Kilkis. 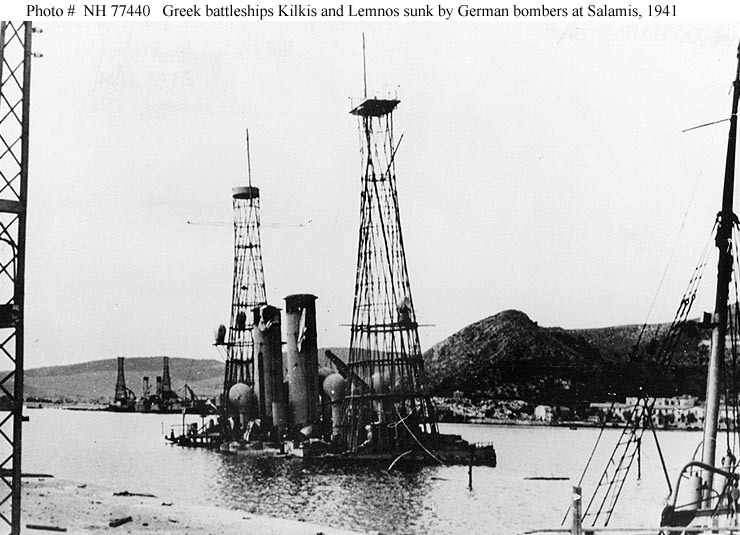 Sunk by German bombers while moored in Salamis near Athens on April 10, 1941. 3.57k Uncle Sam's New Engines of War. Battleships Idaho (BB-24) & Mississippi (BB-23) now building. Most formidable of their size in the world. Image and text provided by Minnesota Historical Society; Saint Paul, MN. Photo from The Saint Paul Globe. (St. Paul, Minn.) 1896-1905, 05, March 1905, Image 10, via chroniclingamerica.loc.gov. 2.49k The powerful battleship Mississippi (BB-23) and her pretty sponsor. Image and text provided by Library of Congress, Washington, DC. & Kansas State Historical Society; Topeka, KS. Photos from the The Washington Times. (Washington [D.C.]) 1902-1939, 30 September 1905, Last City Edition, Image 5 & Insert The Topeka State Journal. (Topeka, Kan.) 1892-1980, 25 September 1905, LAST EDITION, Image 8, by via chroniclingamerica.loc.gov. The Mississippi, Peerless Battleship,Will Be Launched—Excels Others Image and text provided by Minnesota Historical Society; Saint Paul, MN. Photo from The Minneapolis Journal. 1888-1939, 30 September 1905, Image 1, via chroniclingamerica.loc.gov. 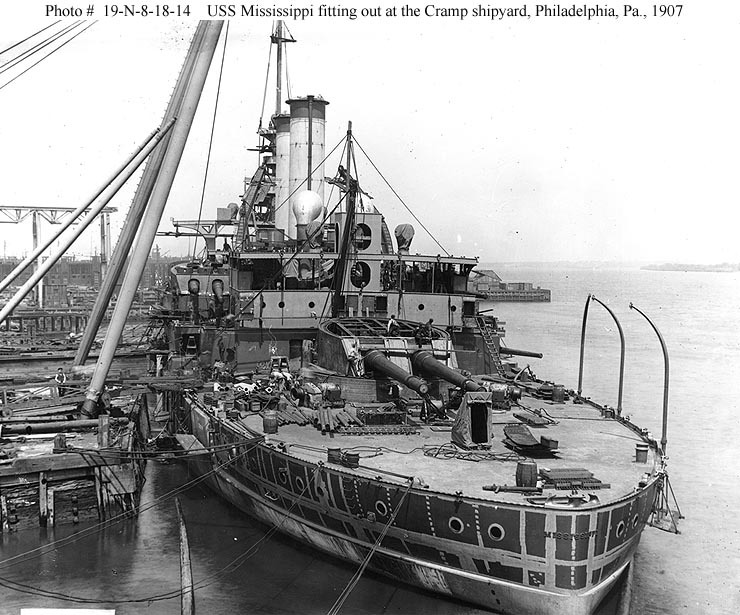 46k The Mississippi (BB-23) slides down the launching ramps at the Cramp Shipyard, Philadelphia, Pennsylvania, 30 September 1905. Photo courtesy of greatwhitefleet.info, by William Stewart. 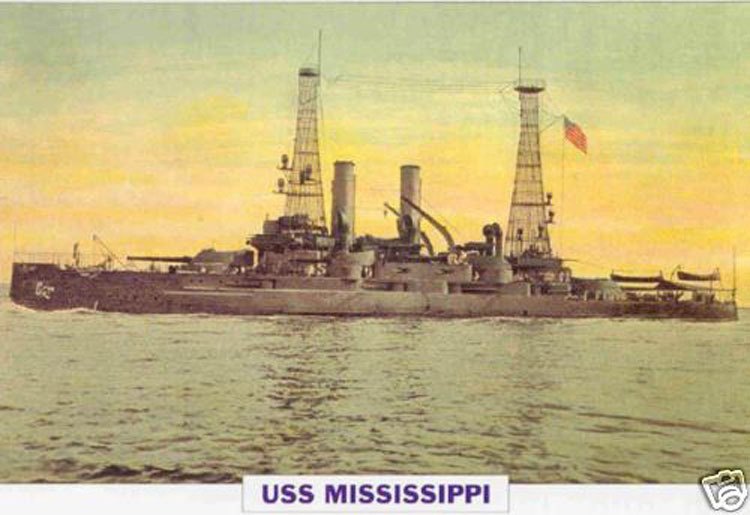 NR NEW BATTLESHIP MISSISSIPPI (BB-23) Image and text provided by University of Utah, Marriott Library. Photo from Deseret Evening News. (Great Salt Lake City [Utah]) 1867-1920, 14 October 1905, Last Edition, Part Two, Image 13, via chroniclingamerica.loc.gov. 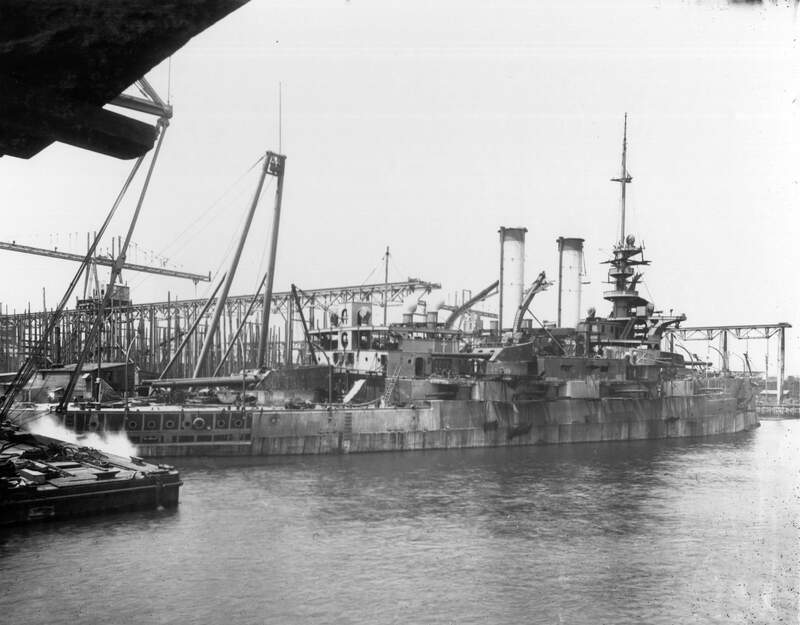 112k Mississippi (BB-23) fitting out at the Cramp shipyard, Philadelphia, Pennsylvania, in 1907. Note: Ship's name on stern; & the primer paint on hull seams and incomplete after turret top armor plate and access hatches Text courtesy of Don Wagner. 412k Mississippi (BB-23) fitting out at the Cramp shipyard, Philadelphia, Pennsylvania, in 1907. USN photo # 19-N-8-18-15, from NARA, College Park, Maryland, courtesy of Sean Hert. Winslow and Fremont Named for Mississippi (BB-23) and New Hampshire (BB-25) Image and text provided by Library of Congress, Washington, DC. Photo from The Washington Times. (Washington [D.C.]) 1902-1939, 25 October 1907, Last Edition, Image 2, via chroniclingamerica.loc.gov. 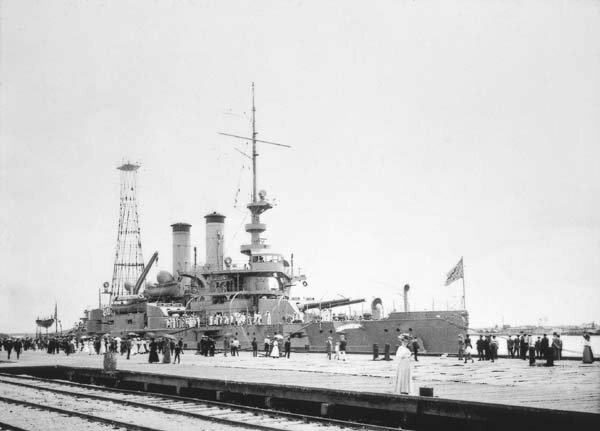 82k Idaho (BB-24) and Mississippi (BB-23) fitting out at the Cramp shipyard, Philadelphia, Pennsylvania, circa late 1907 or early 1908. 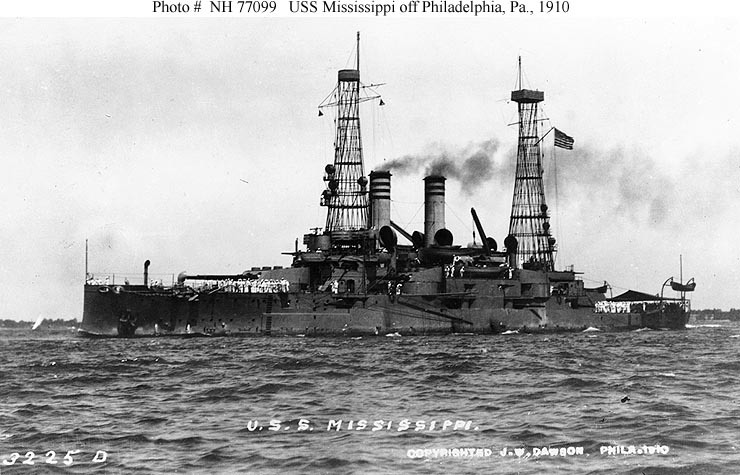 Mississippi, commissioned in February 1908, is presumably the more complete ship, in the center of the photograph. USNHC # NH 86366, courtesy of Ted Stone, 1977. 337k Mississippi (BB-23) & Idaho (BB-24) at the Cramp shipyard, Philadelphia, Pennsylvania, 12 September 1908. Photo courtesy of Tommy Trampp. 354k 1908 photo, as completed with military masts. USN photo # 19-N-14-9-10, from NARA, College Park, Maryland, courtesy of Sean Hert. 51k Mississippi (BB-23) as completed, line drawing by A.D. Baker III. Photo and text courtesy of U.S. Battleships: An Illustrated Design History by Norman Friedman. 137k A few Marines await visitors coming inboard the Mississippi (BB-23). Photographed # PR-03-Box-69-5, by William H. Rau, Philadelphia, Pennsylvania, courtesy of the Library of Congress & National Museum of the U.S. Navy via flickr.com. 579k View looking forward from the ship's port bridge wing, 1908. Note the 12"/45 gun turret with grating hatches open; also winch and capstans, with decorated tops on the latter. An old fortification is in the left distance. The photograph was taken off Goat Island in the East Passage of Rhode Island's Narraganset Bay. The "old fortification" seen in the distance is Fort Adams. During the early 1900's, the fleet customarily anchored in an area lying from the cove to the left of Fort Adams, to Goat Island and over to downtown Newport's waterfront. Text courtesy of Dave Fiske, ONI Liaison to Center for Naval Analysis. Photo by Enrique Muller Jr.
USN photo # 19-N-0008, from NARA, College Park, Maryland, courtesy of Sean Hert. 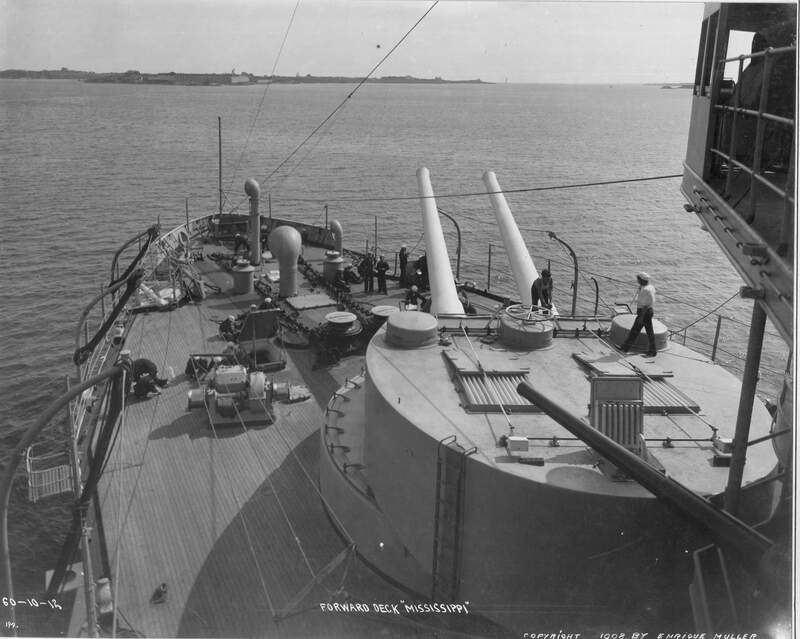 573k View on the foredeck, looking aft, with the forward 12"/45 gun turret trained to starboard, 1908. Note: anchor chain and capstans; hatches; bridge structure with ship's bell attached below its forward end. Photo by Enrique Muller Jr.
USN photo # 19-N-60-10-14, from NARA, College Park, Maryland, courtesy of Sean Hert. 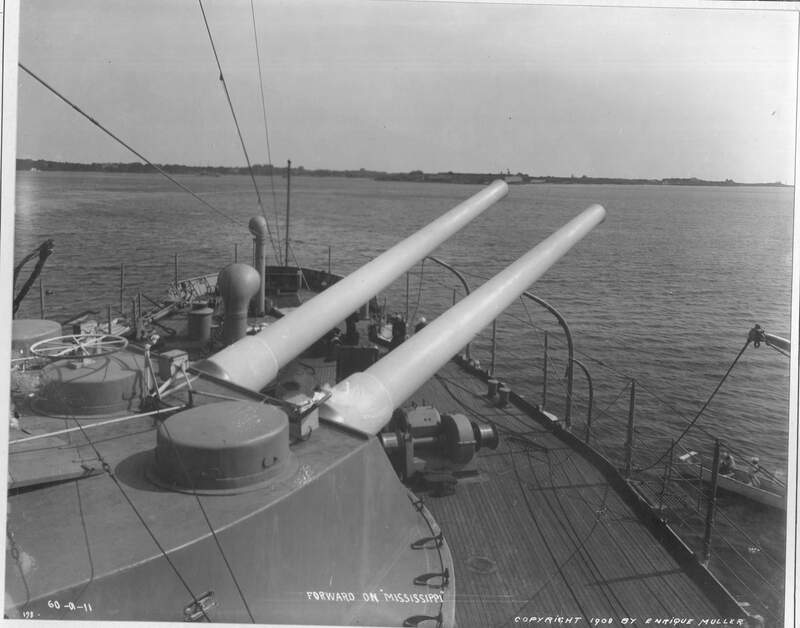 434k Forward deck of the Mississippi (BB-23), turret pointed to starboard. Photo by Enrique Muller Jr.
USN photo # 19-N-60-01-10 & 19-N-60-10-10, from NARA, College Park, Maryland, courtesy of Sean Hert. 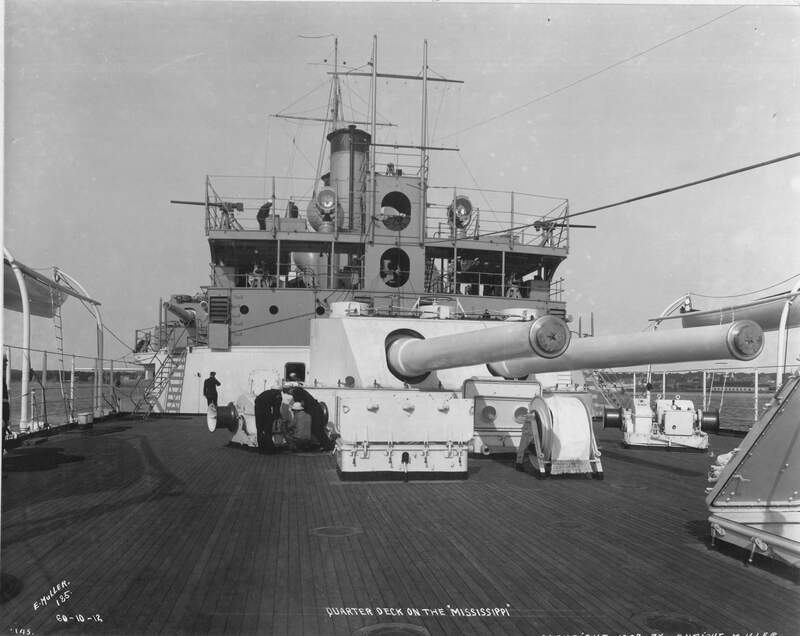 514k View on the after-deck, looking forward, 1908. Note: 12"/45 gun turret; after bridges with stump mainmast, searchlights and 3-pounder guns; winches, hatches and hose reel on the main deck. Photo by Enrique Muller Jr.
USN photo # 19-N-60-10-12, from NARA, College Park, Maryland, courtesy of Sean Hert. NR The ship departed Cuban waters 1 May for a cruise up the river which shared her name, the mighty Mississippi. Calling at the major ports of this great inland waterway, she arrived at Natchez 20 May, and then proceeded 5 days later to Horn Island where she received a silver service from the state of Mississippi. 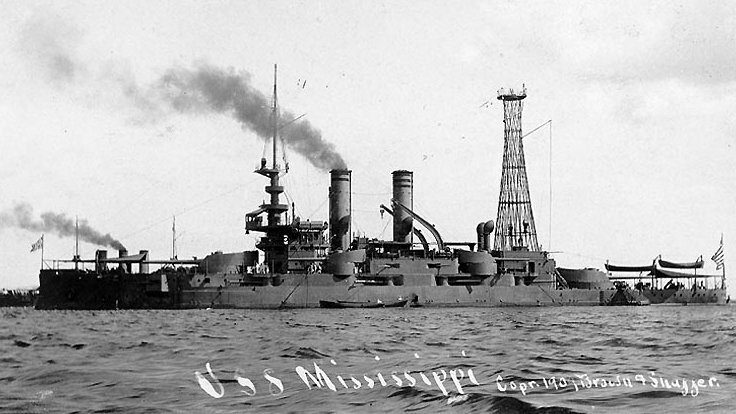 BATTLESHIP MISSISSIPPI (BB-23), THE FIRST MODERN WAR VESSEL TO NAVIGATE THE FATHER OF WATERS. Text courtesy of DANFS. Image and text provided by Ohio Historical Society, Columbus, OH. Photo from The Marion Daily Mirror. (Marion, Ohio) 1892-1912, 11 May 1909, Image 1, via chroniclingamerica.loc.gov. Mississippi (BB-23) D0ES 207 MILES IN 14 HOURS. On the Way to Horn Island, Where Presentation of Silver Service Will Be Made. Image and text provided by University of Kentucky, Lexington, KY.
Photo from The Hickman Courier. (Hickman, Ky.) 1859-current, 03 June 1909, Image 2, via chroniclingamerica.loc.gov. Sir—The department to in receipt, by reference from the president, of your letter of a recent date protesting against the acceptance of the silver service presented to the United States steamship Utah by the state of Utah which, it is alleged, to engraved with a picture of Brigham Young - and the Mormon temple and in reply begs to inform you that it does not feel that it can prescribe the pattern or design of- any service; This, it would seem it has no concern in, and in the past such details have always been considered as pertaining to the individual' state. If it be true that the silver service for the Utah has been patterned as your report the department to inclined to the opinion that it would be injudicious and inadvisable to raise any question of issues in which it can be in no wise concerned. Very respectfully, BEEKMAN WINTHROP. Assistant Secretary of the Navy. The Utah controversy recalls that which followed the publication - of the action of the state of Mississippi in engraving the picture of Jefferson Davis, the president of the Confederate states, on the silver service presented to the battleship Mississippi (BB-23). All sorts of resolutions and objections were raised to this action on the part of Mississippi, but they had no effect, and the picture of the president of the southern Confederacy is on the plate. Image and text provided by State Historical Society of North Dakota. Photo from The Evening Times. (Grand Forks, N.D.) 1906-1914, 07 January 1911, Image 1, via chroniclingamerica.loc.gov. NR Range Finding Tower on Battleship Mississippi (BB-23). Image and text provided by Louisiana State University; Baton Rouge, LA. Photo from The True Democrat. (Bayou Sara [La.]) 1892-1928, 22 May 1909, Image 7, via chroniclingamerica.loc.gov. NR The Huge Battleship Visits Bayou Sara Image and text provided by Louisiana State University; Baton Rouge, LA. Photo from The True Democrat. (Bayou Sara [La.]) 1892-1928, 22 May 1909, Image 1, via chroniclingamerica.loc.gov. 2.23k BATTLESHIP MISSISSIPPI (BB-23) AT ANCHOR OFF THE NAVY YARD Image and text provided by University of Florida. Photo from the The Pensacola Journal. (Pensacola, Fla.) 1898-1985, 29 May 1909, Image 1, via chroniclingamerica.loc.gov. 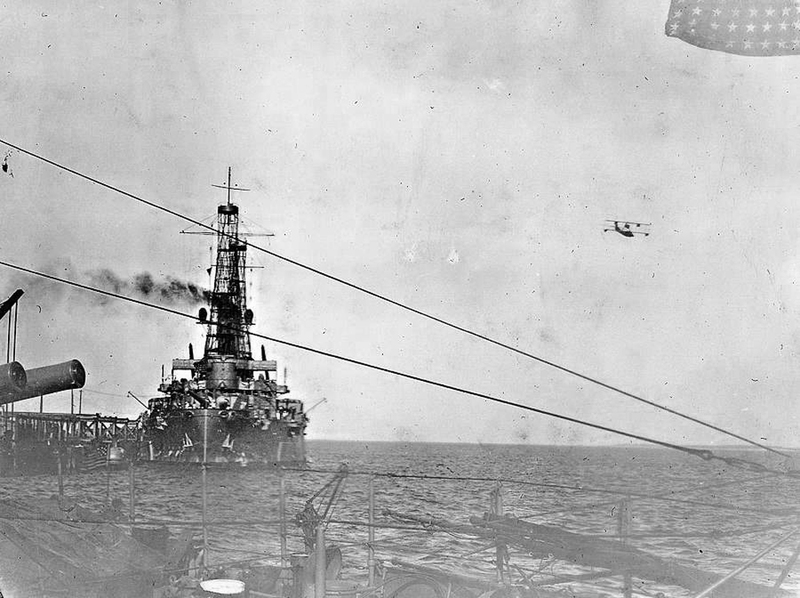 1.10k Mississippi (BB-23) underway, circa 1909, soon after she received a "cage" mainmast. Note that she is still fitted with a bow decoration. Text courtesy of USNHC # NH 61241. 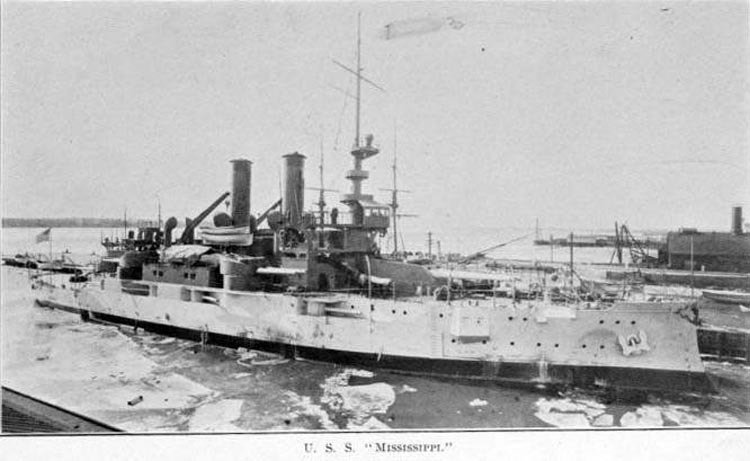 66k Ice in the harbor with the Mississippi (BB-23) between 1908 & 1910. USN photo courtesy of Darryl L. Baker. 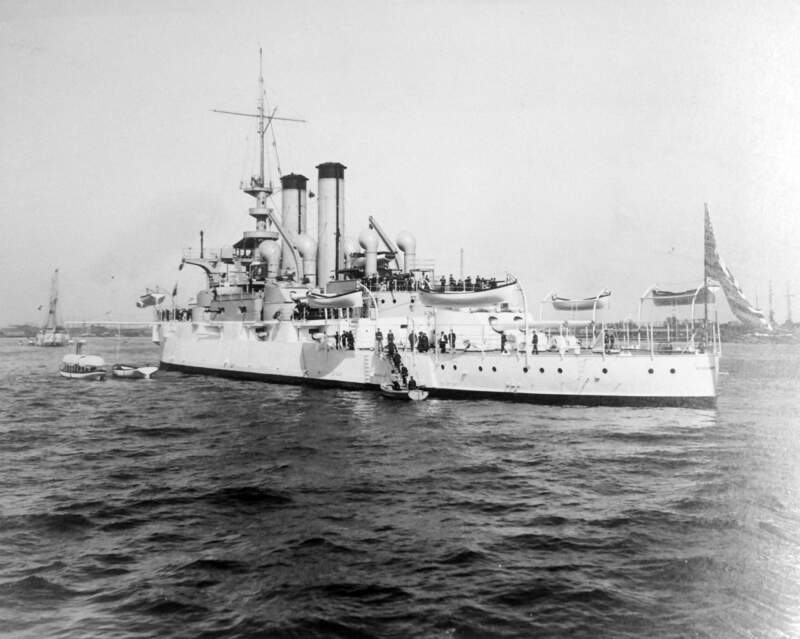 61k Mississippi (BB-23) at anchor with another ship in port, possibly after 10 February, sailing that day to join the "Great White Fleet" as it returned from its famous world cruise. Photographed by Brown & Shaffer, 1909. USNHC # NH 101498, collection of Chief Quartermaster John Harold. Partial text courtesy of DANFS. 218k Capt. 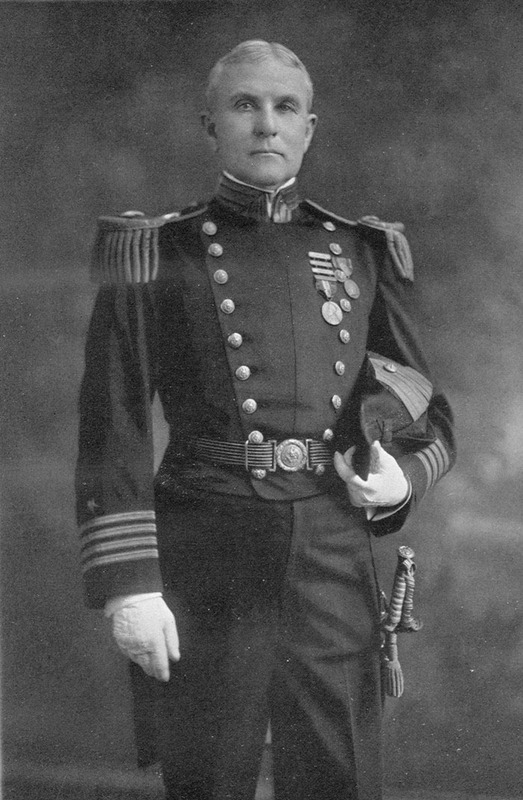 William Freeland Fullam was the commanding officer of the battleship Mississippi (BB-23) from 1909 to 1910. Photo courtesy of the United States Naval Academy & submitted by Bill Gonyo. 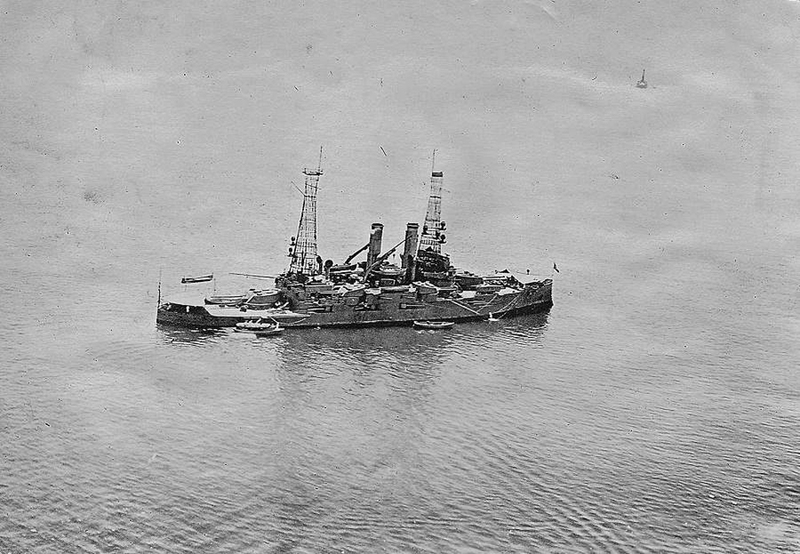 32k "Photograph of a postcard of Mississippi (BB-23) near Horn Island in June 1909 with a cage mast aft and a military mast forward. 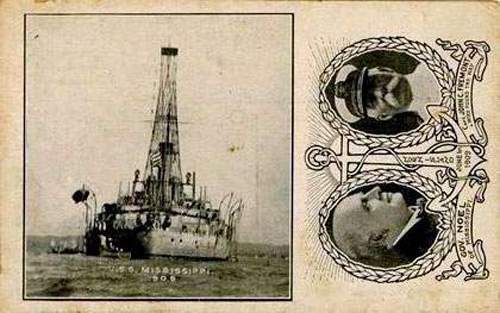 Also pictured postcard is Governor Edmund F. Noel of Mississippi and the commanding officer of the battleship, Captain John C. Freemont, USN. Text courtesy of Don Wagner. Photo courtesy of Mississippi Department of Archives and History via Don Wagner. 928k Mississippi (BB-23) in the Hudson River for the Hudson-Fulton Celebration, 25 September - 9 October 1909. Photo det 4a16081 courtesy of loc.gov via Detroit Photographic Company. 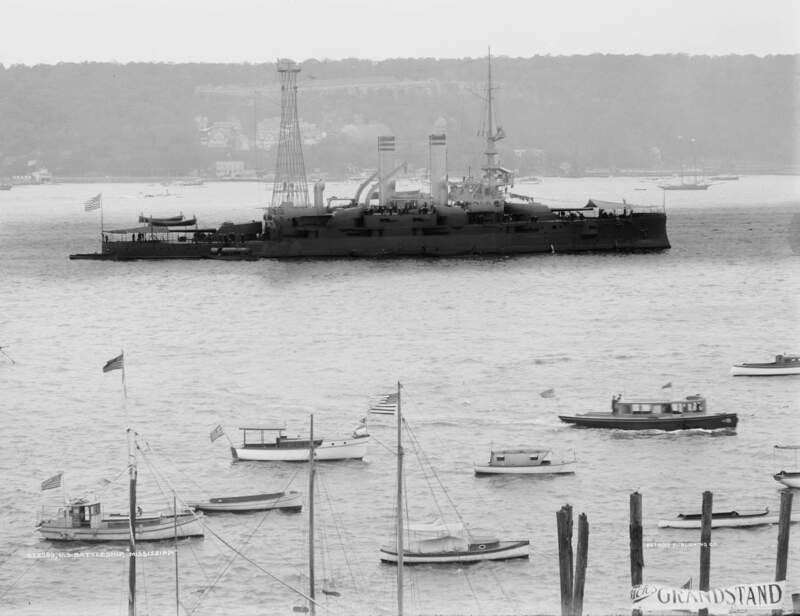 805k Panoramic view of battleships in the Hudson River for the Hudson-Fulton Celebration, 25 September - 9 October 1909. Photo det pan 6a16597 courtesy of loc.gov via Detroit Photographic Company. 2.92k Line of battleships up the Hudson River. Hudson-Fulton Celebration in September 1909. The photo shows the English battle cruiser HMS Inflexible on the left. 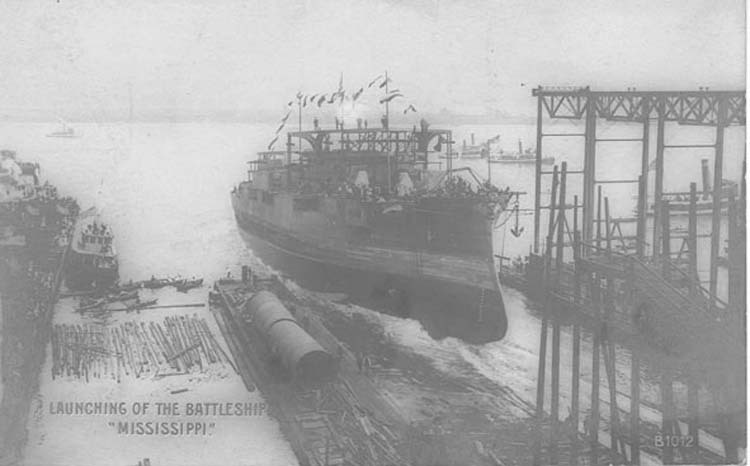 The Mississippi (BB-23) is to her right. Beyond her is the New Hampshire (BB-25) and the rest of the US battlefleet. Fort Lee, New Jersey is across the river. Photo i.d. courtesy of Richard M. Jensen. 78k At Philadelphia, Pennsylvania, in 1910, shortly after she was fitted with a a cage foremast. USNHC # NH 77099 photographed by J.W. Dawson. 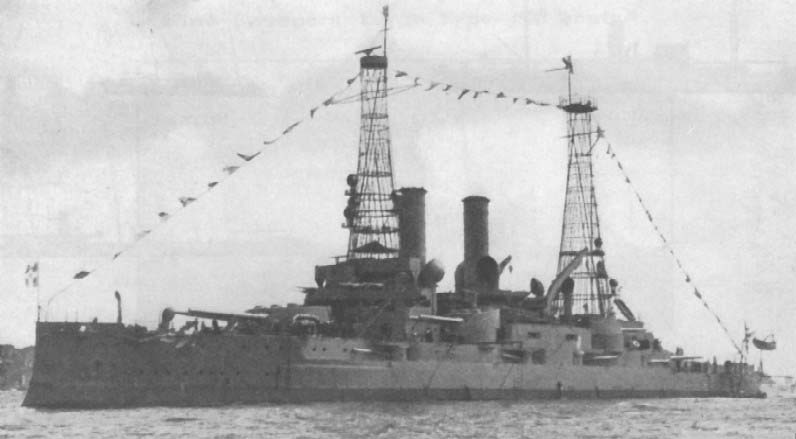 27k Mississippi (BB-23) circa 1910, shortly after she was fitted with a cage mast. Courtesy of Joe Radigan. 43k Mississippi (BB-23) class after modification with cage masts. Photo and text courtesy of globalsecurity.org. 127k Guantanamo Bay, Cuba Second Regiment of the U.S. Atlantic Fleet at Deer Point Camp, Guantanamo Bay, 13 February 1910. These men are from the battleships Minnesota (BB-22), New Hampshire (BB-25), Mississippi (BB-23) and Idaho (BB-24). The latter's battalion is in the center of the photograph. Ships in the harbor are mainly battleships, with some auxiliaries and cruisers also present. Newark (C-1), Station Ship at Guantanamo Bay, is in the center background, with a white hull. USNHC # NH 105511. Donation of Truman C. Lane, 1990. Panoramic photograph by American Photo Company, Havana, Cuba. 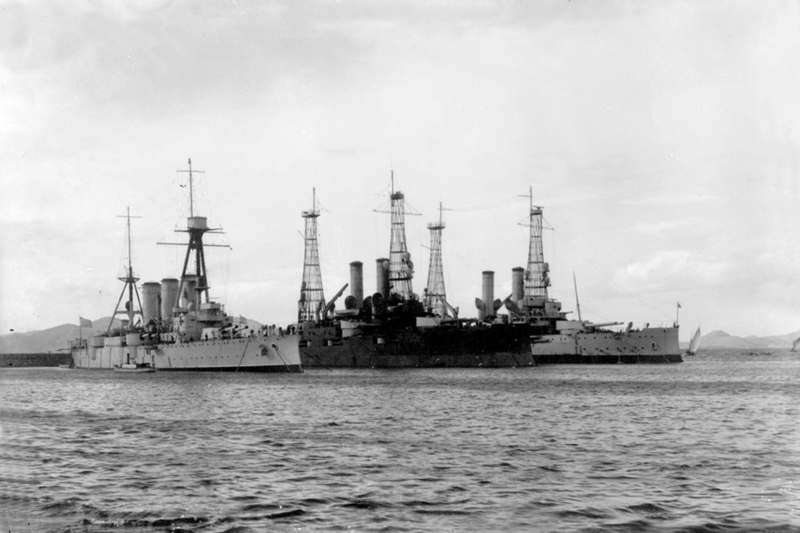 62k Panoramic image (made from two individual views), showing U.S. Atlantic Fleet battleships and auxiliaries in Guantanamo Bay, circa the early or middle 1910s. Ships present include (in left half of image): four Virginia class (BB-13 / 17) battleships, one South Carolina class (BB-26 / 27) battleship, one Delaware class (BB-28 / 29) battleship, two unidentified auxiliaries and a collier; (in right half of image): all six Connecticut class (BB-18 / 22 & 25) battleships, both Mississippi class (BB-23 / 24) battleships, two unidentified auxiliaries, hospital ship Solace (AH-2) and a gunboat. USNHC # NH 104537. Photo from the 1909-1924 album of Vice Admiral Olaf M. Hustvedt, USN (Retired). Courtesy of Rick Hauck, 2006. 44k Photographed on 3 October 1911, probably off New York City. 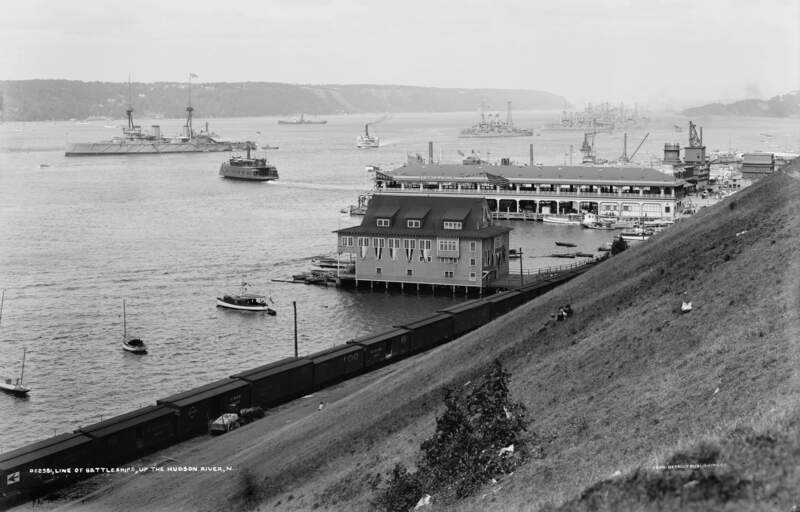 Photograph # 19-N-13607, from the Bureau of Ships Collection in the U.S. National Archives. 65k Capt. 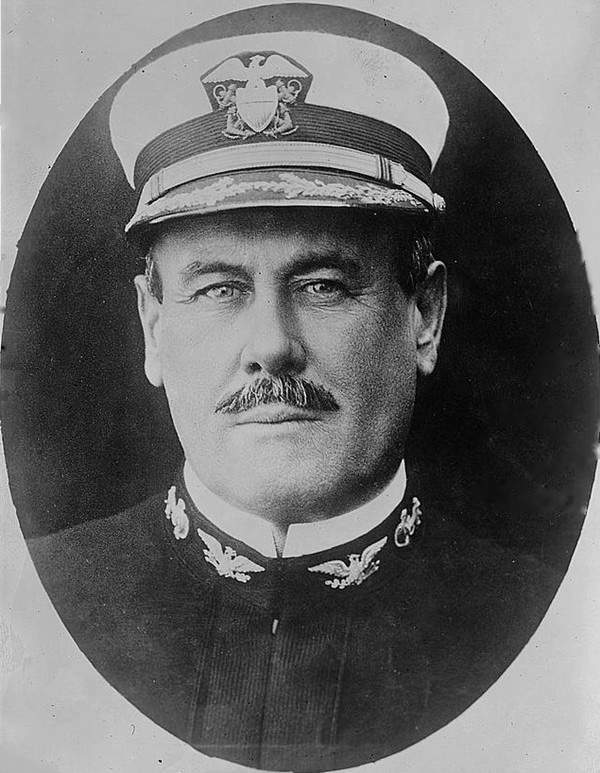 William John Maxwell was the commanding officer of the battleship Mississippi (BB-23) in 1911. Photo courtesy of the Library of Congress via Bill Gonyo. 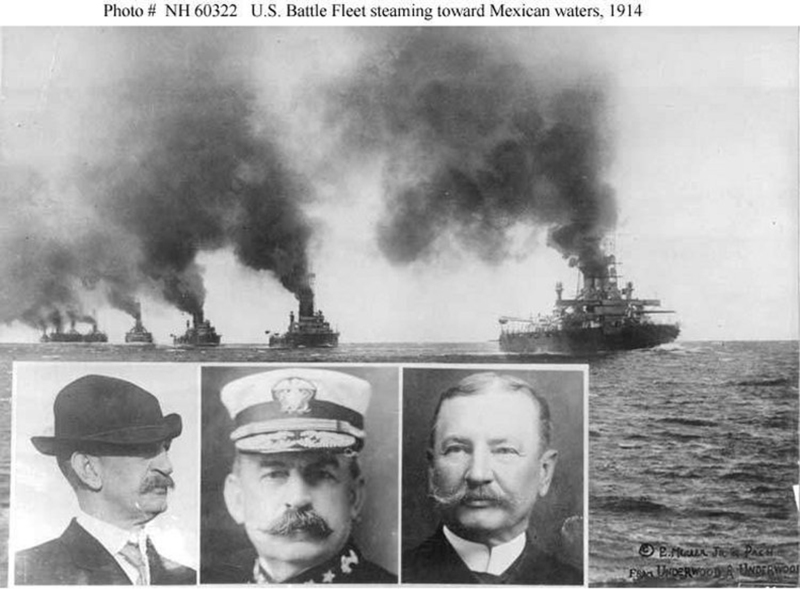 71k U.S. Atlantic Fleet battleships steaming toward Mexican waters in 1914. Photograph copyrighted in 1914 by E. Muller, Jr., and Pach. Ohio (BB-12), Virginia (BB-13), Nebraska (BB-14), Georgia (BB-15), New Jersey (BB-16), Rhode Island (BB-17), Connecticut (BB-18), Louisiana (BB-19), Vermont (BB-20), Kansas (BB-21), Minnesota (BB-22), Mississippi (BB-23), Idaho (BB-24), New Hampshire (BB-25), South Carolina (BB-26), Michigan (BB-27), Delaware (BB-28), North Dakota (BB-29), Florida (BB-30), Utah (BB-31), Wyoming (BB-32), Arkansas (BB-33), New York (BB-34) & Texas (BB-35). Rear Admiral Charles J. Badger. USNHC # NH 60322. 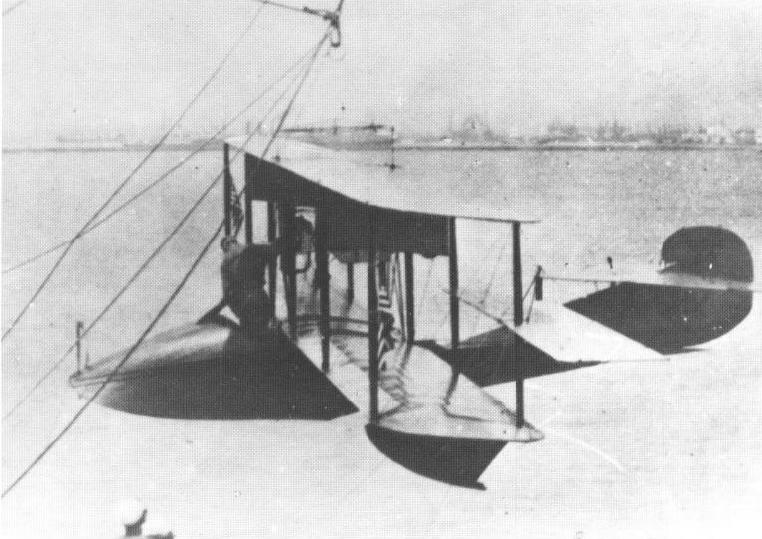 121k Reactivated from the Atlantic Reserve Fleet on 30 December 1913, Mississippi (BB-23), with then Lieutenant Commander Mustin in command, was ordered to proceed in company with the reactivated Orion (AC-11) to Annapolis and Norfolk to embark newly trained navy pilots, enlisted mechanics, aircraft and hanger equipment. 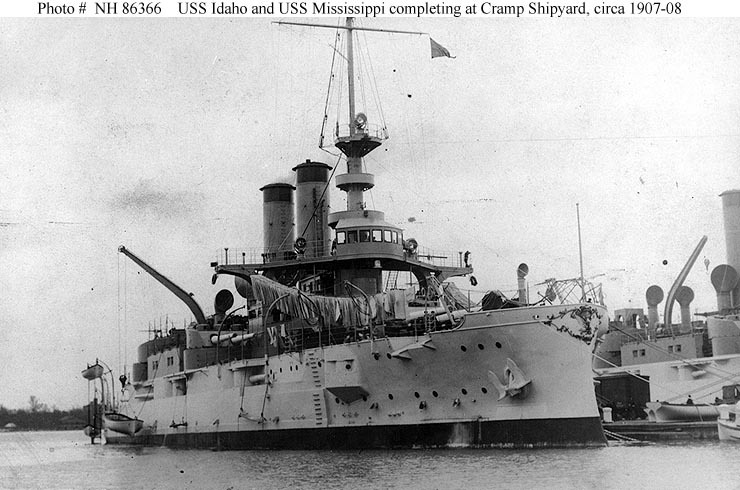 After loading, the two vessels proceeded in company to the former site of the old and dilapidated Pensacola Navy Yard (1826-1911) and establish a new Naval Aeronautical Station. 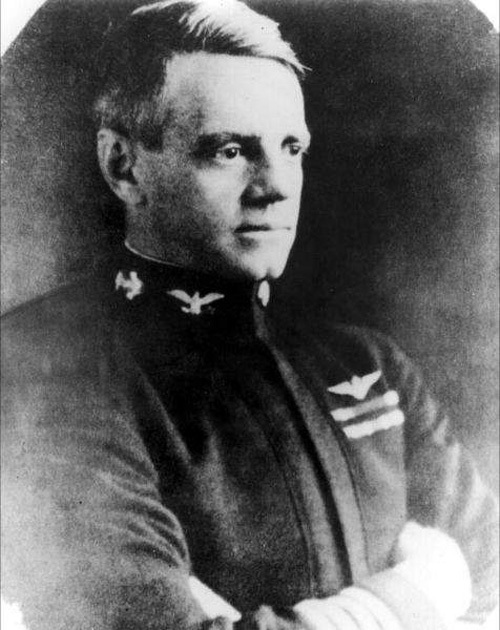 Prior to the two ships arrival in Pensacola Bay on 20 January 1914, LCDR Mustin was officially designated as the Navy's Air Pilot #3 - thus, Mississippi was under command of a qualified Naval Aviator. 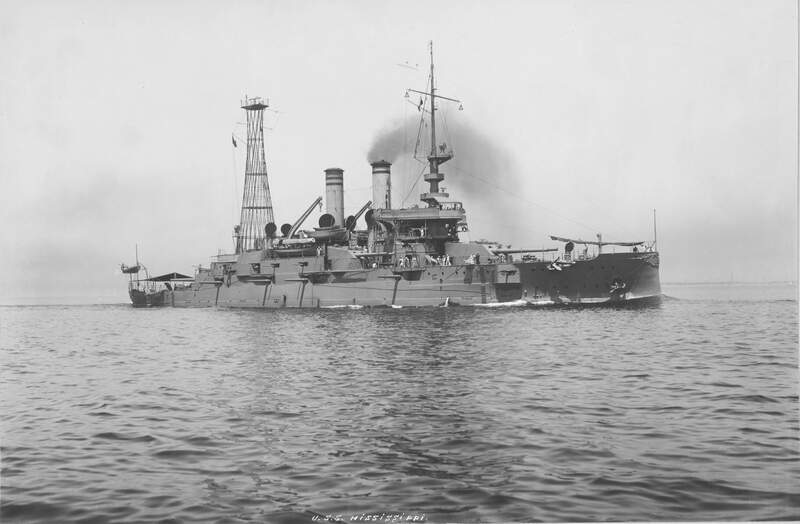 While in Pensacola Bay, Mississippi was designated as the Aeronautical Station Ship, Pensacola and retain that designation until she was duly relieved as the station ship by North Carolina (ACR-12) later in the year. 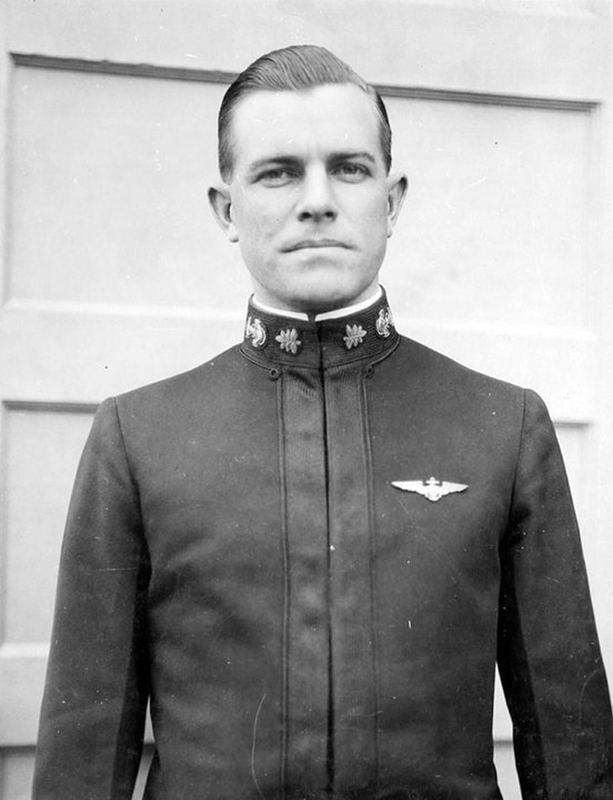 While in Pensacola Bay, LCDR Mustin also wore the hat as the first Commandant, Naval Aeronautical Station, Pensacola (January 1914 - January 1916) which is the present day "Cradle of Naval Aviation" - Naval Air Training Center Pensacola, Florida. Text courtesy of Don Wagner. Photo courtesy of State Archives of Florida - #RC18993. 112k "With orders to embark "one aeroplane section" from the Naval Aeronautical Station, and with LCDR Mustin in command of Mississippi (BB-23), she sailed from Pensacola Bay on 21 April 1914 for Vera Cruz, Mexico for scouting and observation duties in support of the U. S. forces responding to the crisis. Birmingham (CL-2), with a similar complement of aircraft embarked, simultaneously sailed from Pensacola Bay for assignment in and around the port of Tampico, Mexico. 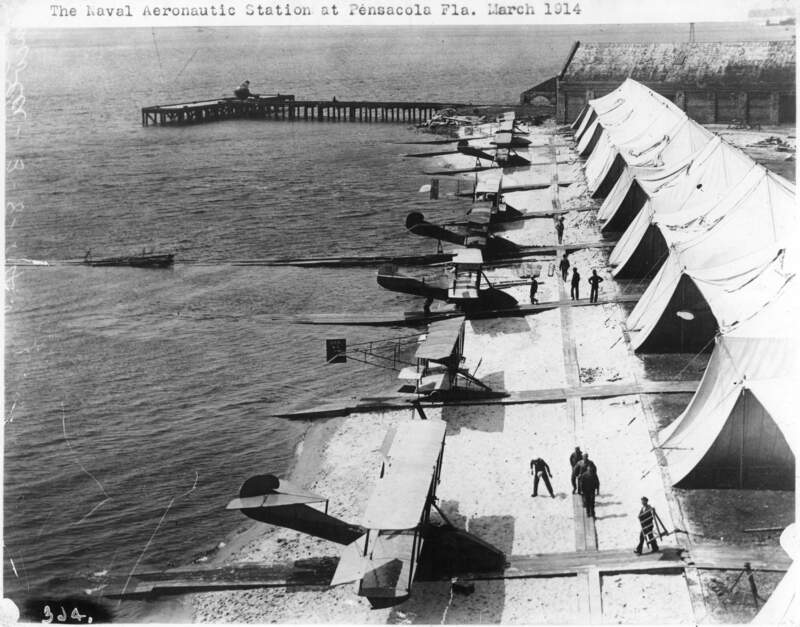 Shown on Mississippi's port side main deck is a Curtiss "Flying Boat" (designated and numbered AB-3). 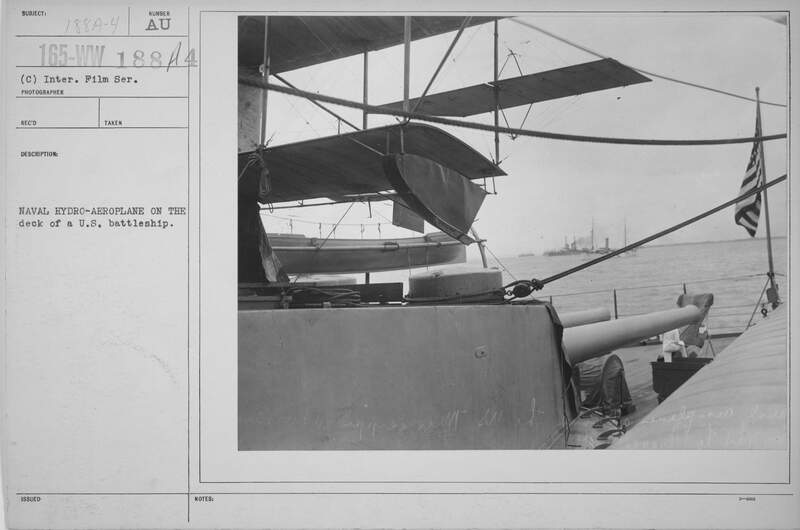 Secured to the top of the after 12"/.45 caliber twin turret, is the second aircraft of the "section" - a Curtiss pontoon type "Hydroaeroplane"(designated and numbered AH-3). Note the jerry-rigged boat boom attached to the bulkhead and supported by lines to the "cage mast" (also referred to as a "fighting tower" or "basket mast") for the handling of aircraft to and from the water." Text courtesy of Don Wagner. Official USN photo # 80-G-461428, now in the collections of the National Archives. 1.90k On 25 April, Lieutenant (junior grade) Patrick N.L. Bellinger climbed aboard the AB-3 flying boat and made a reconnaissance over the waters around Veracruz in search of mines that had been reported, thus having the distinction of making the first flight of an American military aircraft under combat conditions. Operating from rustic encampments ashore, the naval aircraft instituted a regular schedule of flights from both Tampico and Veracruz, though the most action came at the latter location. On 2 May 1914, Bellinger and Ensign W.D. Lamont flew the AH-3 hydroaeroplane in direct support of ground troops when they were called upon to perform aerial reconnaissance near Tejar, Mexico, in search of enemy forces firing at encamped U.S. Marines. 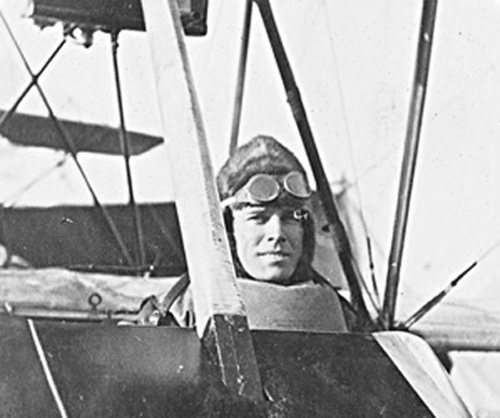 Four days later, Bellinger and Lieutenant (junior grade) Richard C. Saufley returned from a mission with bullet holes in the fabric wing of their aircraft, having been taken under fire by Mexican riflemen during a scouting flight. As Bellinger later recounted in an article for National Geographic, the U.S. aircraft carried no weapons and on one of his last flights in Mexico, he decided to exact some measure of revenge on the Mexican forces and grabbed the nearest thing he could find in camp. Thus, he made a bar of soap the first air to ground ordnance dropped from a Navy aircraft. Photo & text from April 2009 edition of navalaviationmuseum.org. AH-3 link is Photo # NH 2275 from the U.S. Naval History and Heritage Command via ibiblio.org. PDF Image and text provided by University of South Carolina; Columbia, SC. Photo from The Anderson Daily Intelligencer. (Anderson, S.C.) 1914-1917, 01 May 1914, Image 5, via chroniclingamerica.loc.gov. 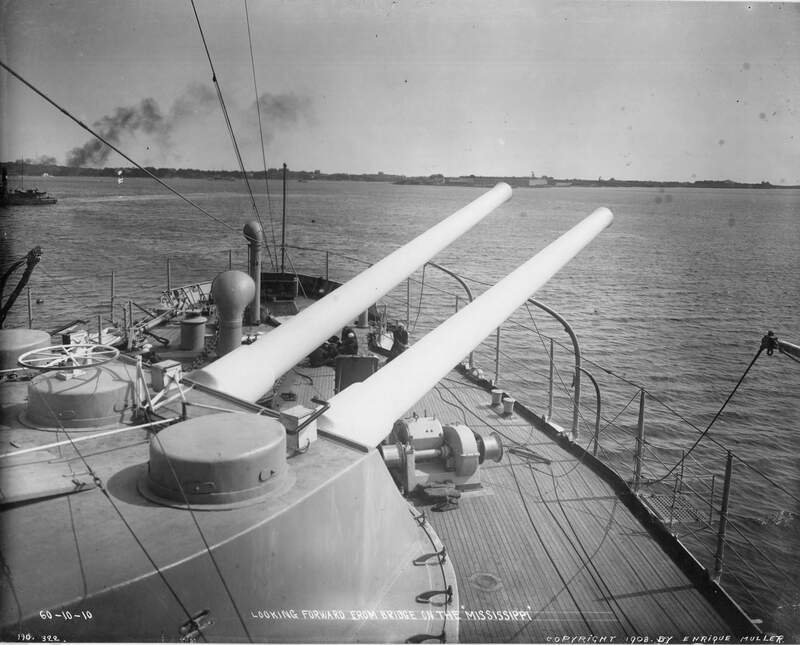 297k In 1914, during the United States occupation of Veracruz, while flying off the Mississippi (BB-23), Lt. (j.g.) Patrick Nieson Lynch Bellinger became the first American to encounter enemy fire in an airplane, and was recommended for the Medal of Honor. He retired with the rank of vice admiral on 7 July 1947. USN photo courtesy of Bill Gonyo. 1.80k NAVAL HYDRO-AEROPLANE ON THE deck of a U.S. battleship. My guess would be the Mississippi (BB-23). Photo courtesy of Record Group 165, ARC Identifier 31485797,National Archives Catalog. 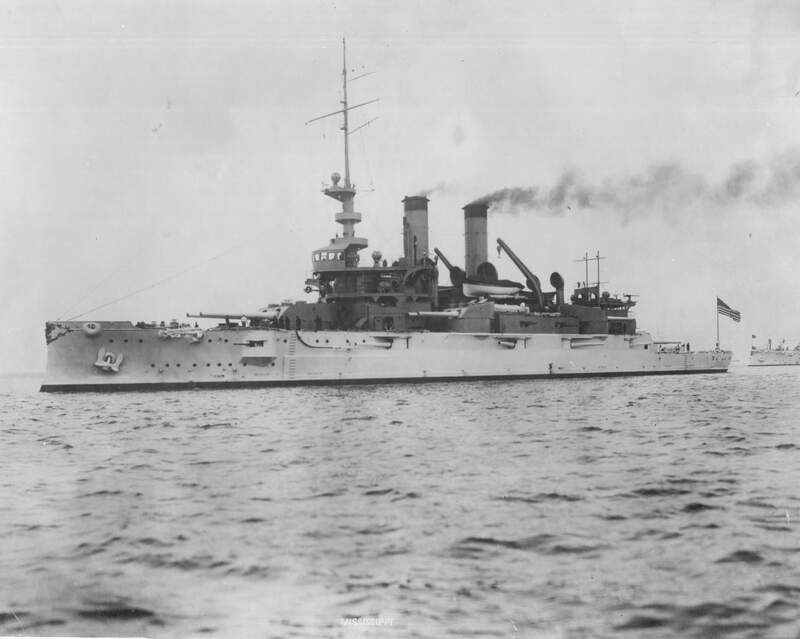 The battleship Mississippi (BB-23) with a full complement of aeroplanes and equipment, steamed into Vera Cruz harbor this morning, and before nightfall the American aeroplane corps will be given their first experience in real war: The warship which brought the corps from Key West has joined Rear Admiral Badger's fleet. The military aviators are ready to take up their air scouting, and are but awaiting orders. Image and text provided by Library of Congress, Washington, DC. Photo & text by The Washington Times. (Washington [D.C.]) 1902-1939, 24 April 1914, HOME EDITION, Image 2, courtesy of chroniclingamerica.loc.gov. 68k "Mississippi's (BB-23) assigned Flying Boat AB-3 on the temporary boom. 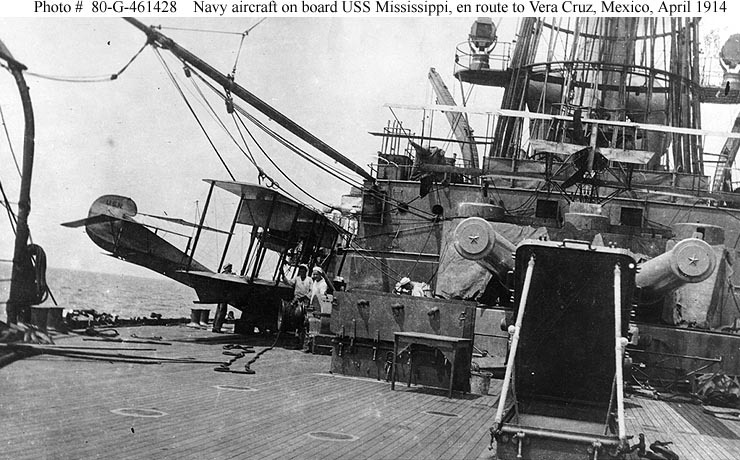 Some of the ship's boats had been removed to allow space for aircraft handling, stowage and maintenance prior to departure from Pensacola's Naval Aeronautical Station for her Vera Cruz mission that lasted from 24 April - 12 May 1914." Text courtesy of Don Wagner. Photo from the University of San Diego History Department & submitted by Bill Gonyo. 458k Aerial view of the Mississippi (BB-23) circa 1914. US Navy and Marine Corps Museum/Naval Aviation Museum, Photo No. 2008.104.001, courtesy of Mike Green. 427k Bow on view of the Mississippi (BB-23), in 1914, serving as a a station ship at Naval Air Station Pensacola, Florida. She has boilers lit and is belching smoke. A Curtiss Flying Boat can be seen flying overhead. US Navy and Marine Corps Museum/Naval Aviation Museum, Photo No. 2008.104001.006, courtesy of Mike Green. 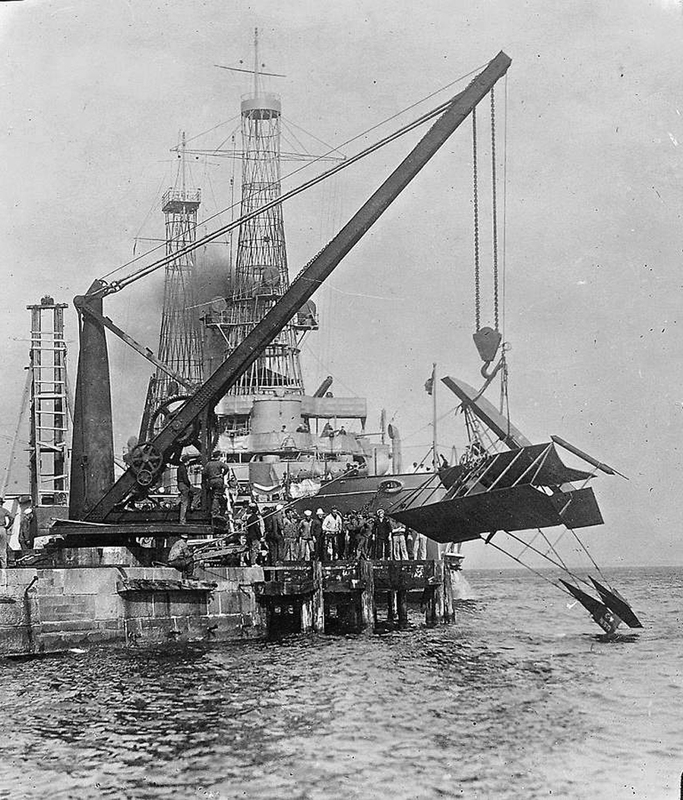 776k With the Mississippi (BB-23) moored in the background, a shore crane at Naval Aeronautical Air Station Pensacola, Florida, hoists an Curtiss A-2 pusher aircraft out of the water after a crash circa 1914. US Navy and Marine Corps Museum/Naval Aviation Museum, Photo No. 2008.104.001.013. courtesy of Mike Green. 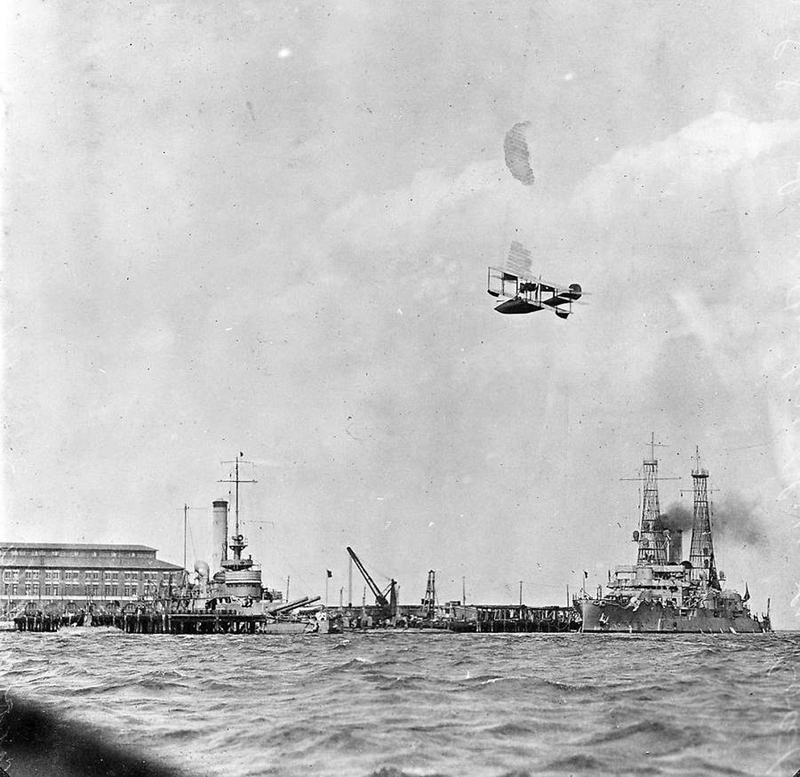 610k With the Mississippi (BB-23) and an unidentified monitor, either Arkansas (M-7), Connecticut (M-8) or Florida (M-9) moored in the background, an early Curtiss flying boat overflies the ships at Naval Air Station Pensacola circa 1914. US Navy and Marine Corps Museum/Naval Aviation Museum, Photo No. 2008.104.001.012. courtesy of Mike Green. 757k United States Navy Flying Boats at Sea Image and text provided by Library of Congress, Washington, DC. Photo from New-York Tribune. (New York [N.Y.]) 1866-1924, 05 July 1914, Image 40, via chroniclingamerica.loc.gov. Daniels Plans to Build New Dreadnought With the $12,000,000 They Will Bring. Image and text provided by The New York Public Library, Astor, Lenox and Tilden Foundation. Photo from The Evening World. (New York, N.Y.) 1887-1931, 28 May 1914, Image 2,via chroniclingamerica.loc.gov. 856k LITTLE OBJECTION TO SALE FOR BIG PRICE OF TWO OBSOLETE BATTLESHIPS. 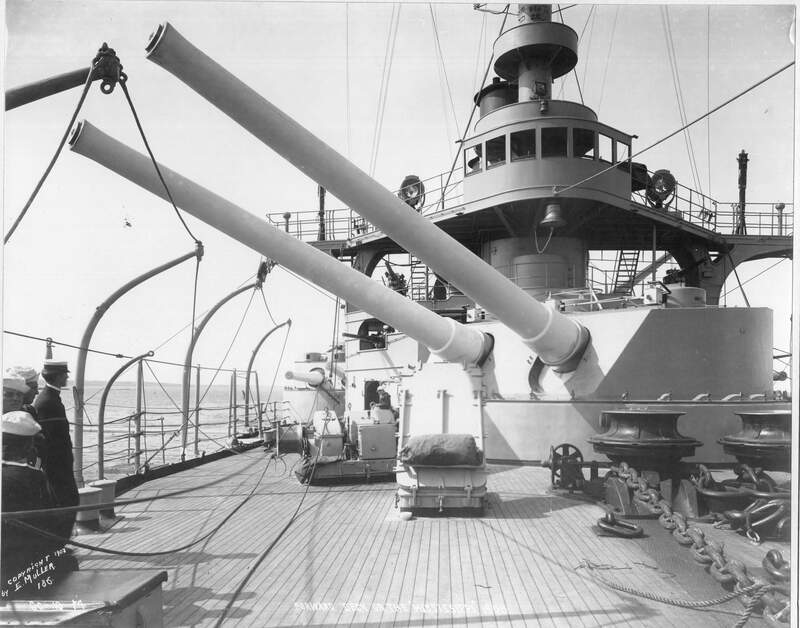 Forward deck of Mississippi (BB-23). Image and text provided by University of Utah, Marriott Library. Photo from The Ogden Standard. (Ogden City, Utah) 1913-1920, 20 June 1914, 4 P.M. City Edition, Image 4, via chroniclingamerica.loc.gov. GREEKS ASSURED HIM NO WAR IS CONTEMPLATED Image and text provided by Library of Congress, Washington, DC. Photo from The Washington Times. (Washington [D.C.]) 1902-1939, 22 June 1914, HOME EDITION, Image 1, via chroniclingamerica.loc.gov. Secretary Daniels Receiving $12,535,275 check for the Idaho (BB-24) and the Mississippi (BB-23). Image and text provided by Library of Congress, Washington, DC. Photo from New-York Tribune. (New York [N.Y.]) 1866-1924, 10 July 1914, Image 4, via chroniclingamerica.loc.gov. READY TO SPRING AT EACH OTHERS THROAT. Each Nation Ordering Dreadnoughts as Fast as Money Can Buy Them. 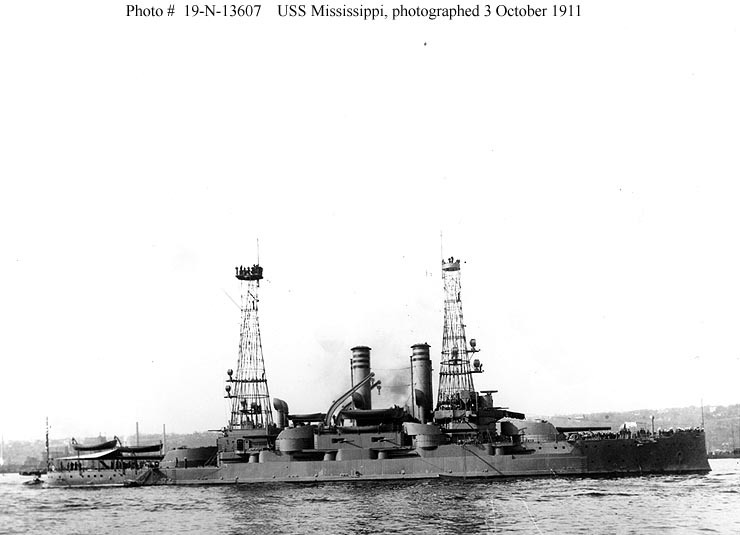 Pictured here is the battleship Mississippi (BB-23). Image and text provided by Library of Congress, Washington, DC. Photo from The Washington Herald. (Washington, D.C.) 1906-1939, 19 July 1914, Page 7, Image 8,via chroniclingamerica.loc.gov. 548k Ex-American warships may see action. Greece's "petticoat" soldiers called out. Pictured below is the Kilkis, the ex-Mississippi (BB-23). Image and text provided by University of Utah, Marriott Library. Photo from The Logan Republican. (Logan, Utah) 1902-1924, 09 October 1915, Image 6,via chroniclingamerica.loc.gov. The entente allies have taken over the Greek battleships Kilkis and Lemnos, which were formerly the United States battleships Idaho (BB-24) and Mississippi (BB-23), respectively, and also the battleship Averof, says another Reuters dispatch. Image and text provided by Oklahoma Historical Society. Photo from The Daily Ardmoreite. (Ardmore, Okla.) 1893-current, 17 October 1916, Image 1, via chroniclingamerica.loc.gov. 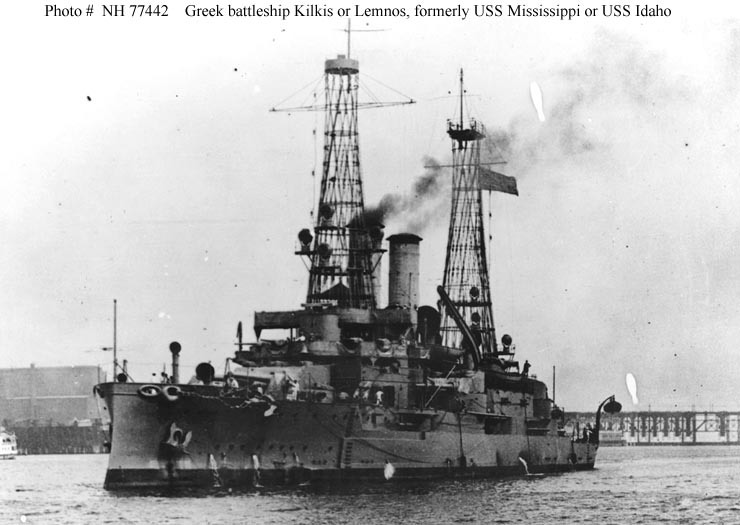 42k Now as the Kilkis, the ex-Mississippi (BB-23) appears here in 1922. Photo courtesy of Robert Hurst. 52k The Kilkis, the ex-Mississippi (BB-23) appears here at Malta, date unknown. Photo courtesy of Robert Hurst & Lee Wetherhorn. 57k Greek battleship, either Kilkis or Lemnos. Photographed in a U.S. port. Kilkis was the former Mississippi (BB-23). Lemnos was originally Idaho (BB-24). USNHC # NH 77442. 527k A very rare photo of all the 3 last Greek battleships together. Place and time unknown, probably between 1927 and 1931, the year that Kilkis pulled out of service. 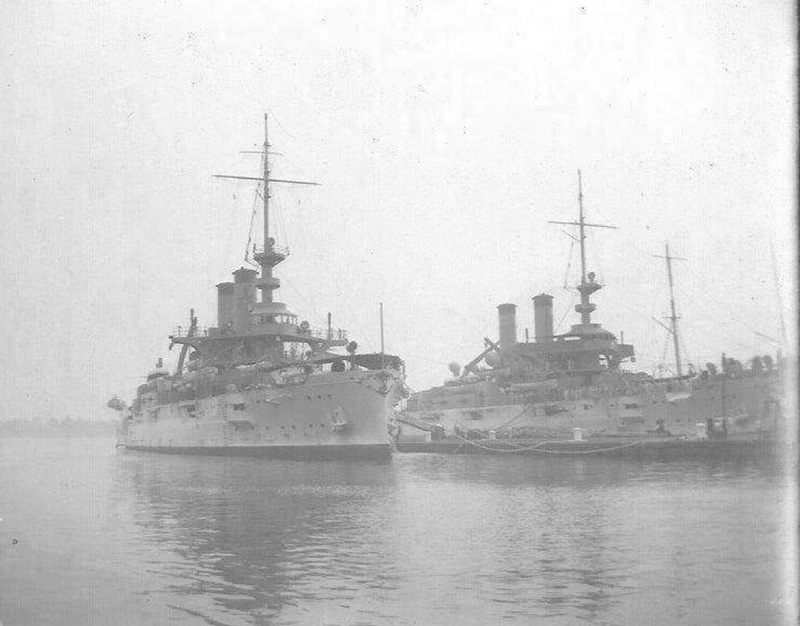 From left, battlecruiser Averof, in the middle probably Kilkis, at right probably Lemnos. 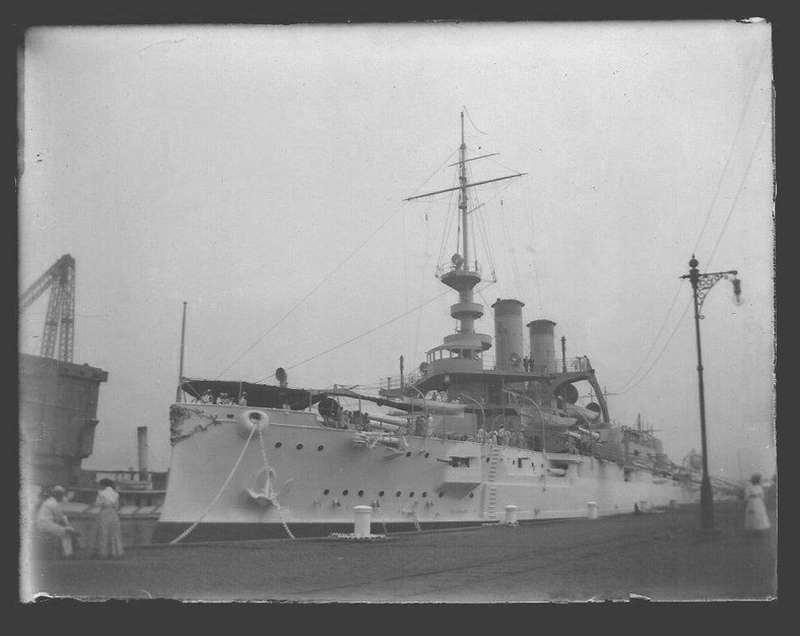 Averof is known as a Battleship in Greece, although she is only an armored cruiser, because of her excellent performance against real Turkish battleships, on Greek-Ottoman war of 1912-1913. She exists as a restored naval museum after surviving two World Wars and anchored on Palaio Faliro Naval museum, Athens, Greece. Official Photo from Averof archive, courtesy of Andreou Manolis. 896k Kilkis in color, probably in Malta. Official Photo from Averof archive, courtesy of Andreou Manolis. 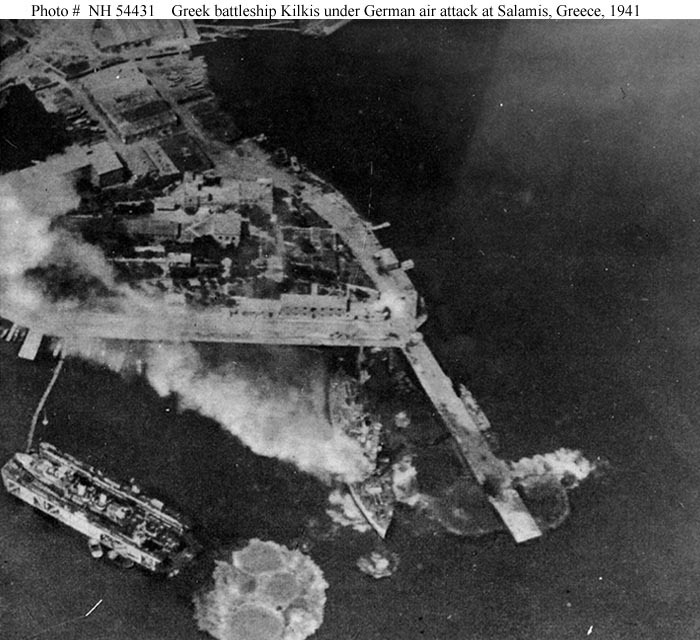 89k Under attack by German JU 87 dive bombers, at the Greek naval base at Salamis, 23 April 1941. 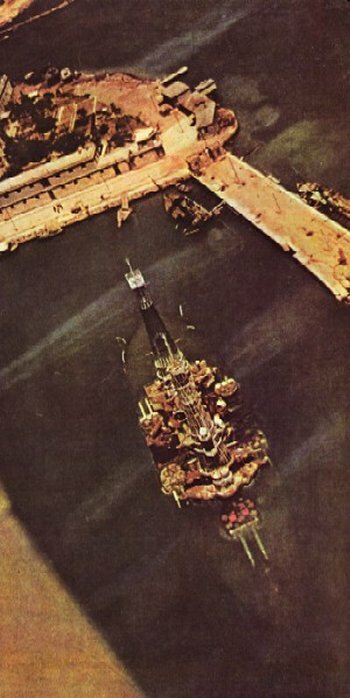 In the lower left, in the floating drydock, is the destroyer Vasilefs Georgios. 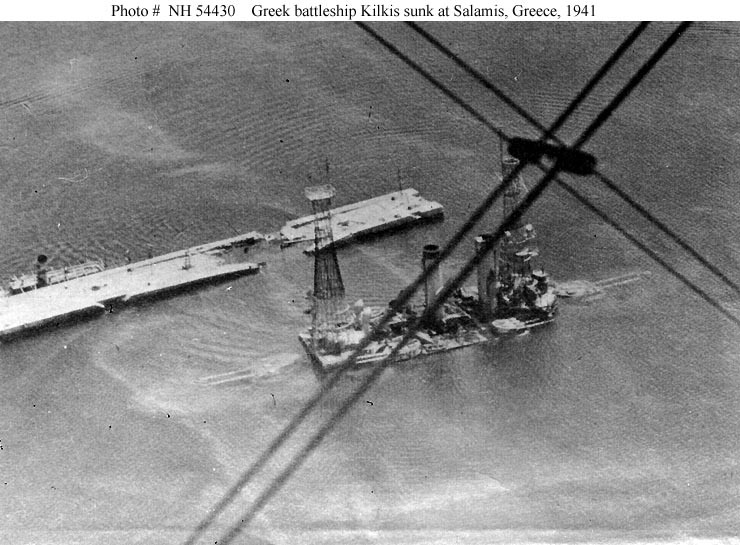 Kilkis, the former Mississippi (BB-23), was sunk in this attack. 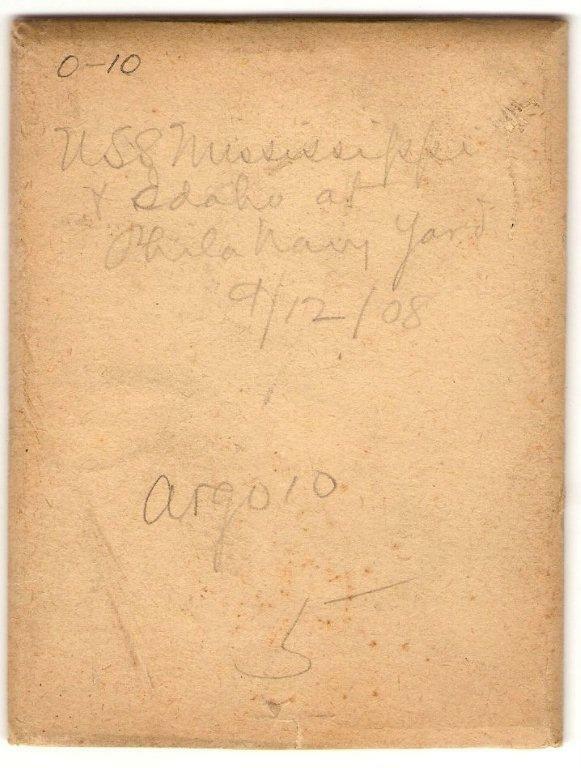 The floating dock and destroyer were also sunk (reportedly on 20 April ? ), but Vasilefs Georgios was subsequently raised and placed in service by the German Navy as Hermes (ZG-3). USNHC # NH 54431 photograph and some caption information were provided by Franz Selinger. 74k Greek battleships Kilkis and Lemnos. Sunk in the basin of the Greek naval base at Salamis after they were hit by German air attacks on 23 April 1941. Seen from the harbor pier following the arrival of the German army. Kilkis, the former Mississippi (BB-23), is in the foreground. Lemnos, ex-Idaho (BB-24), is in the distance, with her guns removed. USNHC # NH 77470 / German Army. 93k Greek battleship Kilkis sunk at Salamis, Greece, 1941. USNHC # NH 54430 / German Army. 58k Color photo of the Greek battleship Kilkis, looking from the bow on at her sunk at her mooring at Salamis, Greece, 1941. Photo courtesy of Robert Hurst from Purnells History of the Second World War. 201k Figurehead of the Battleship Mississippi (BB-23), presented to the State of Mississippi By the U.S. Navy Department December 1909. 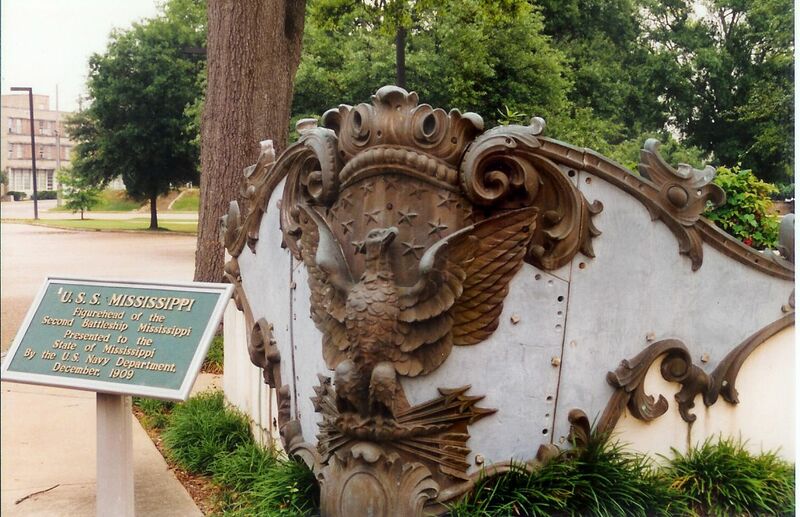 The marker is located in Jackson, Mississippi. Photo & text by Mike Stroud of Bluffton, South Carolina & submitted by Bill Gonyo. 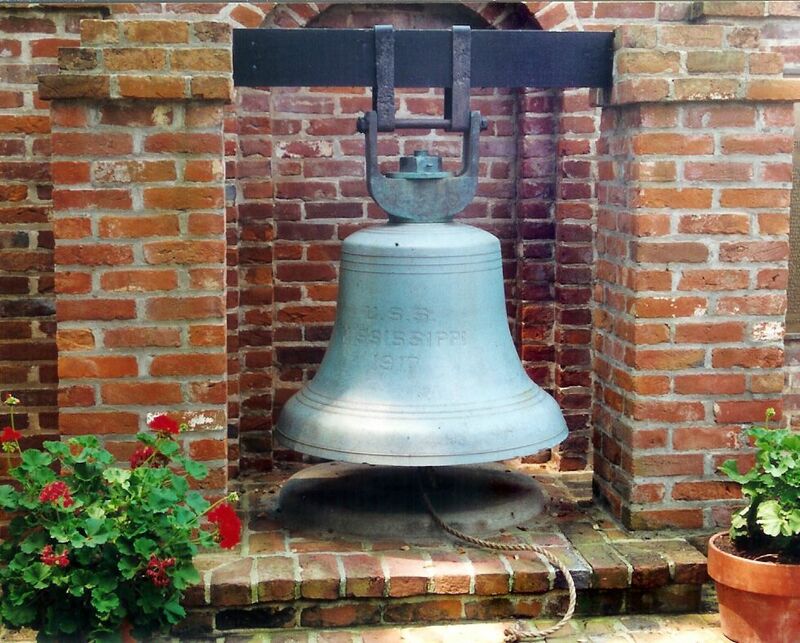 170k The bell of the Mississippi (BB-23) was used on three ships named for the state, it was donated to Rosalie Mansion and its owners, the Daughters of the American Revolution. It is proudly displayed in the gardens at Rosalie Mansion, on the site of Fort Rosalie overlooking the Mississippi River. Visitors are allowed to ring the bell with the attached pull rope. Photo & text by Mike Stroud of Bluffton, South Carolina & submitted by Bill Gonyo.